Born in 1923 to an inn owner, Staudegger would find himself within the ranks of the SS at 17. Staudegger would fight in the Western Campaign within the infantry of the LAH. During fighting in France, Staudegger was wounded and when convalescing he joined the panzer corps and was in one of the first schools for Germany's newest tank, the Tiger I. Staudegger's first claim to fame is when he single-handily destroyed two enemy tanks with a single grenade each while dismounted. This action would see him awarded the Eisernes Kreuz 1. Klasse. Next notable action was during the Battle of Kursk when Staudegger and another Tiger crew engaged a Russian tank force of 50-60 tanks and successfully destroyed over half stalling the assault. 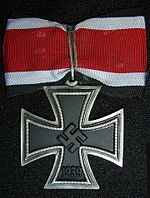 For this action he was awarded the Ritterkreuz des Eisernen Kreuzes on July 10, 1943, making him the first Tiger tank commander with that honor. 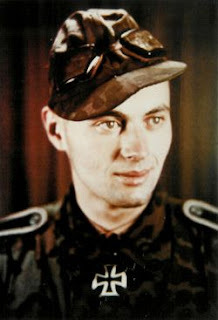 Staudegger would then find himself continuing to fight on the Eastern and Western Fronts with the 101st/501st Heavy Panzer Battalion until the war's end where he reached the rank of Oberscharführer. He then worked in various positions in post-war Germany until his death in 1991.